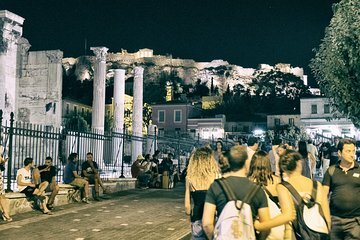 Obtenga un control exhaustivo de Grecia en esta visita guiada de 8 días, permanezca primero durante 4 noches en Atenas y luego continúe para ver algunos lugares fuera de lo común, muchos de los cuales son sitios declarados Patrimonio de la Humanidad por la UNESCO. Realice recorridos a pie por los mejores lugares de Atenas y aprenda sobre la larga e interesante historia de la ciudad. Después de salir de Atenas, visite el antiguo teatro en Epidauro, pase por el legendario Delfos, aprenda sobre la historia de los juegos olímpicos en Olimpia y explore Meteora, se incluye alojamiento durante la noche y lo acompaña un guía experto. Pasa un tiempo en el teatro en Epidaurus, escuchando su increíble acústica. Visita a los monasterios de Meteora. Wonderful holiday. Comfortable hotels, great food, very knowledgeable and friendly guides. Greece is amazing and the Greek people are lovely, friendly and relaxed. We were very well looked after everywhere we went. There was a heatwave in Athens while we were there but as there were affordable air-conditioned taxis outside our hotel we were able to survive. Our teenage son really enjoyed the holiday and it was great that there were other teenagers on the tour. We would highly recommend this tour. We rated this 'total package' only 3/5 stars because this reflects the sum of the parts. This is not a single tour but a composite of many parts: sold as a Viator package, but managed by Mazi Travel in Greece, who arranged and co-ordinate the parts: a transfer to/from Athens airport - by C.C. Travel rated 5/5 b initial 3 nights and final night accommodation at the President Hotel - rated 1/5 stars it is not likely that everyone booked on this tour will be booked into the President Hotel, but if you can, this is a hotel to avoid. Purports to be a 4 star hotel, but this is mere pretence. Smells of stale cigarettes difficult access to shower need to climb over the toilet to access lousy free internet in public areas, but otherwise this is another cost 12 euro/day if you want access in your room, which is not appropriate in 2017 caters to a sea of tourist buses odd/even lifts meaning difficult access to other parties in different floors difficult access to breakfast given huge numbers of tourists c half day Athens tour, by G.O. travel - the tour itself 3/5 stars, but we and another party were not on the passenger list and so we were not picked up as promised we needed to call Mazi Travel to arrange a driver for pick up and joining the tour a little late d 4-day Classic Greece tour by G.O. travel - this tour we are happy to give 4.5/5 stars the tour guide Mikala was excellent and very knowledgable - explaining everything in excellent English and French, interwoven without missing a beat the hotels on this tour were also pretty good, especially the Hotel Europa in Droyva most of the provided dinners were also good, but some of the meals dinner/breakfast and coffee was only passable. Free wifi in all the provided hotels on the 4-day tour. So, to summarise: Some problems with passenger lists we and another party were listed as staying in different hotels than the President causing problems with tour pick-ups, limited tour provided information, and 4 nights at the President Hotel marred what otherwise could be a wonderful Greece odyssey. Our suggestion: if taking this tour - stay somewhere else than the President Hotel, make sure you are on the right passenger list, or otherwise, arrange your own Athens accomodation and take the 4-day Classic Greece tour directly with G.O. travel.